Get outdoors at Conkles Hollow State Nature Preserve and Dayton Aviation Heritage National Historical Park. Your inner history buff will appreciate Carillon Historical Park and Prospect Place. Get out of town with these interesting Columbus side-trips: Dayton (Dayton Dragons Baseball, SunWatch Indian Village/Archaeological Park, & more), Zipline (in Rockbridge) and Eldean Covered Bridge (in Troy). There's much more to do: delve into the distant past at Great Circle Earthworks, take a stroll through German Village, admire the landmark architecture of Frank Lloyd Wright's Westcott House, and explore the landscape on two wheels at Blacklick Woods Metro Park. For where to stay, more things to do, ratings, and other tourist information, read our Columbus vacation planner. Use the Route module to see travel options from your home to Columbus. In July in Columbus, expect temperatures between 83°F during the day and 66°F at night. Cap off your sightseeing on the 24th (Wed) early enough to travel to Houston. Escape the urban bustle at St Francis Wolf Sanctuary and Baytown Nature Center. Get some historical perspective at Fanthorp Inn State Historic Site and George Ranch Historical Park. Get out of town with these interesting Houston side-trips: Flying Saucer (in Sugar Land), Lake Livingston Dam (in Livingston) and Sylvan Beach Park (in La Porte). The adventure continues: steep yourself in history at Saint Anthony Cathedral Basilica, get your game on at The Escape Game Houston, meet the residents at Houston Zoo, and play a few rounds at Hermann Park. To find ratings, maps, other places to visit, and tourist information, go to the Houston visit site . Fly from Columbus to Houston in 5 hours. Alternatively, you can drive; or take a bus. The time zone changes from Eastern Standard Time (EST) to Central Standard Time (CST), which is usually a -1 hour difference. Expect somewhat warmer temperatures when traveling from Columbus in July; daily highs in Houston reach 95°F and lows reach 77°F. Finish your sightseeing early on the 31st (Wed) so you can travel to North Bend. North Bend is a city in King County, Washington, United States. Start off your visit on the 1st (Thu): tour the pleasant surroundings at Railroad Community Park, admire the sheer force of Snoqualmie Falls, and then look for all kinds of wild species at Lake Wilderness Arboretum. Get ready for a full day of sightseeing on the next day: admire the sheer force of Twin Falls and then take in the awesome beauty at Mt Si. To find photos, reviews, more things to do, and other tourist information, you can read our North Bend trip planner . Use the Route module to find suitable travel options from Houston to North Bend. The time zone difference when traveling from Houston to North Bend is minus 2 hours. Expect slightly colder temperatures when traveling from Houston in August; daily highs in North Bend reach 80°F and lows reach 60°F. Cap off your sightseeing on the 2nd (Fri) early enough to travel to Gig Harbor. Gig Harbor is the name of both a bay on Puget Sound and a city on its shore in Pierce County, Washington, United States. Kick off your visit on the 3rd (Sat): admire the natural beauty at Blue Willow Lavender Farm, stroll through Sehmel Homestead Park, and then delve into the lush surroundings at McCormick Forest. To see other places to visit and other tourist information, go to the Gig Harbor tour itinerary planning site . Getting from North Bend to Gig Harbor by car takes about 1.5 hours. In August, daytime highs in Gig Harbor are 78°F, while nighttime lows are 57°F. Cap off your sightseeing on the 3rd (Sat) early enough to travel to Olympia. Olympia is the capital of the U.S. Visiting Tolmie State Park and The Home Course will get you outdoors. Next up on the itinerary: identify plant and animal life at Tumwater Falls Park, have fun and explore at Hands On Children's Museum, relax in the rural setting at Lattin's Country Cider Mill & Farm, and immerse yourself in nature at Millersylvania State Park. For maps, ratings, other places to visit, and more tourist information, refer to the Olympia online trip planner . You can drive from Gig Harbor to Olympia in an hour. Plan for little chillier nights when traveling from Gig Harbor in August since evenings lows in Olympia dip to 52°F. Finish your sightseeing early on the 6th (Tue) so you can drive to Seattle. Get outdoors at Mercer Slough Nature Park and Hiram M. Chittenden Locks. Get some historical perspective at Pioneer Square and West Point Lighthouse. 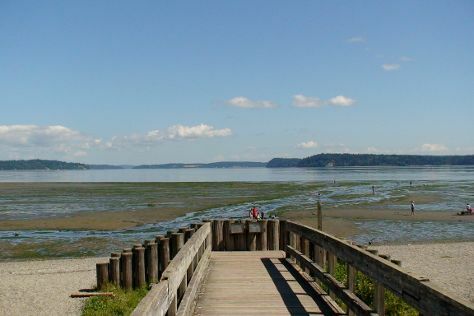 Venture out of the city with trips to Seahurst Beach Park (in Burien) and Picnic Point Park (in Edmonds). Dedicate the 12th (Mon) to wine at some of the top wineries in the area. There's still lots to do: admire the masterpieces at Chihuly Garden and Glass, enjoy the sand and surf at Alki Beach, tour the pleasant surroundings at Golden Gardens Park, and admire all the interesting features of Safeco Field. To find ratings, maps, more things to do, and other tourist information, you can read our Seattle trip itinerary planner . Traveling by car from Olympia to Seattle takes 1.5 hours. Alternatively, you can take a bus. Traveling from Olympia in August, expect a bit warmer with lows of 61°F in Seattle. On the 13th (Tue), wrap the sightseeing up by early afternoon so you can travel back home.